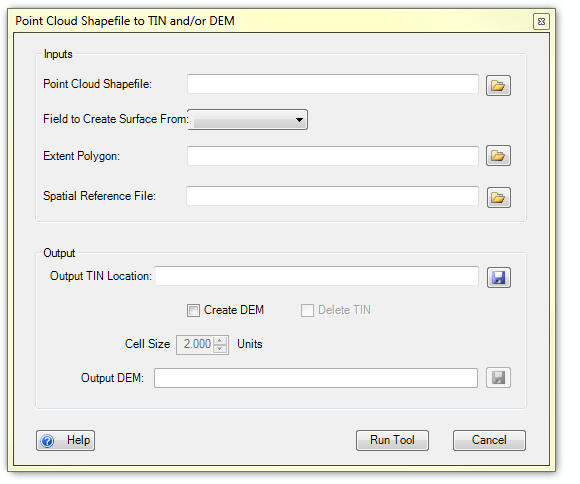 The Create TIN and/or DEM tool allows you to derive a TIN and raster DEM in one step. point shapefile containing the original surveyed z values. This file can be created using the Create Point Feature Class tool located under the Data Preparation tab. polygon shapefile of the survey extent for the point cloud shapfile. This can be created through in GCD with the Create Survey Extent Polygon Tool. can be in the form of a .prj file or a shapefile that contains a spatial reference. DEM created from the TIN. This is only created if the user selects the Create DEM option. GCD Software by ET-AL is licensed under a Creative Commons Attribution-NonCommercial-ShareAlike 4.0 International License.